Glenwood Springs Demon Jackson Kruse attempts to get the ball past the defending Battle Mountain Huskey during Tuesday night's game at Stubler Memorial Field. 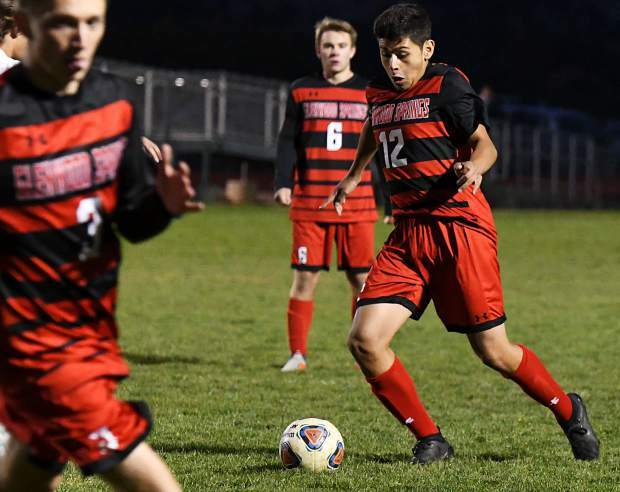 Glenwood Springs Demon Leo Mireles dribbles the ball down the field during Tuesday night's game against the Battle Mountain Huskies at Stubler Memorial Field. 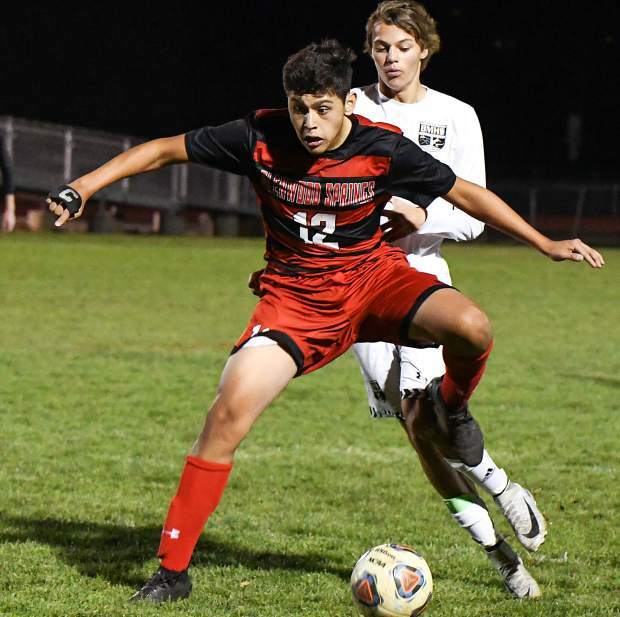 Glenwood Springs Demon Carlos Rodriguez traps the ball during Tuesday night's game against the Battle Mountain Huskies at Stubler Memorial Field. Glenwood Springs Demon Leo Mireles is tripped up by Battle Mountain Huskey Jered Vargas during Tuesday night's game at Stubler Memorial Field. 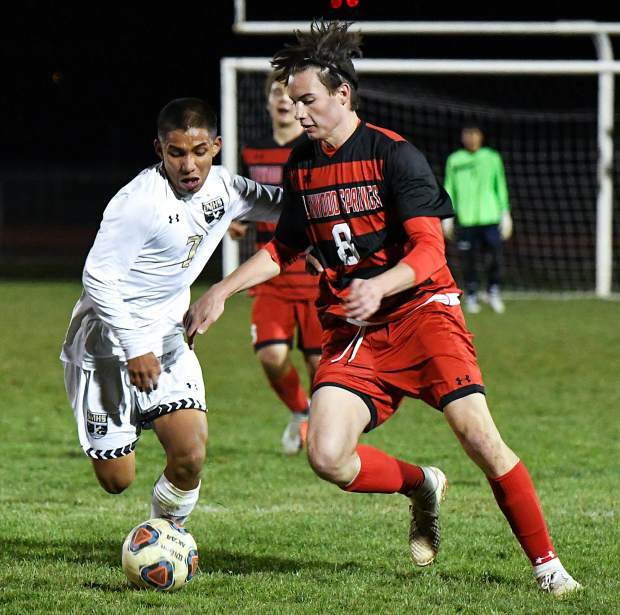 Glenwood Springs Demon Liam Mazzotta dribbles the ball down the field during Tuesday night's game against the Battle Mountain Huskies at Stubler Memorial Field. Glenwood Springs Demon Justin Garces attempts to dribble the ball past the defending Battle Mountain Huskies during Tuesday night's game at Stubler Memorial Field. Glenwood Springs Demon Leo Mireles traps the ball down the during Tuesday night's game against the Battle Mountain Huskies at Stubler Memorial Field. 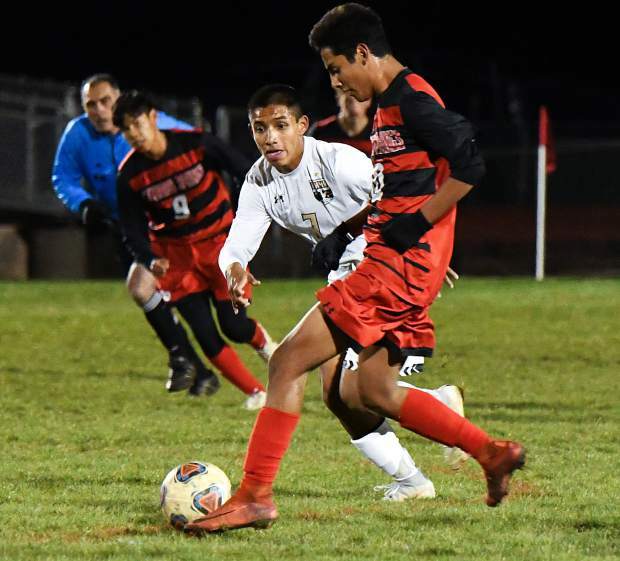 Glenwood Springs Demon Justin Garces dribbles the ball past the defending Battle Mountain Huskies during Tuesday night's game at Stubler Memorial Field. Glenwood Springs Demon Leo Mireles wins possession of the 50/50 ball during Tuesday night's game at Stubler Memorial Field. 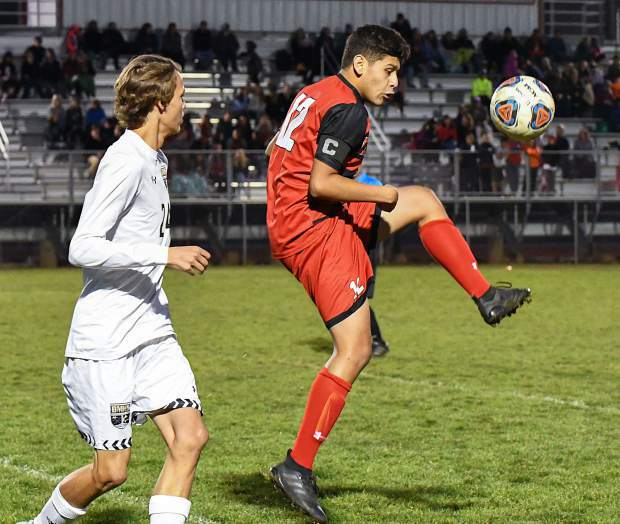 A first-half goal from junior Danny Barajas and a late goal in stoppage time by Jered Vargas were enough to give the Battle Mountain Huskies a 2-0 win on the road at Stubler Memorial Field over the Glenwood Springs Demons on Senior Night. 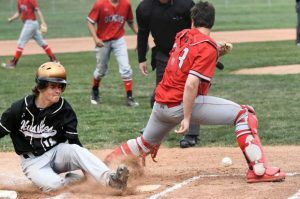 The physical matchup came down to a few botched calls by the officials, giving the Huskies another 4A Western Slope League championship under head coach David Cope. 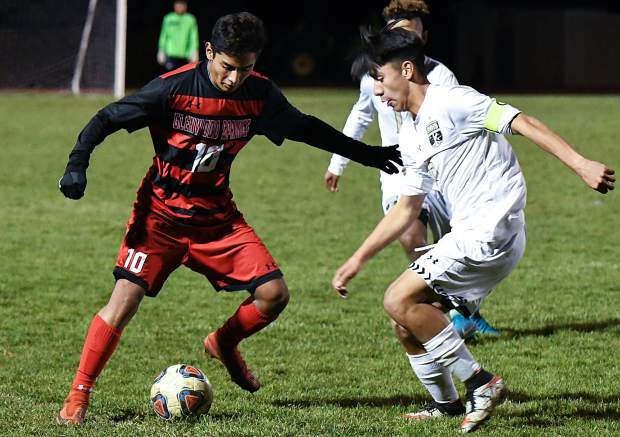 Glenwood had a free kick from senior Leo Mireles that appeared to sneak under the crossbar go uncalled, before the officials took away a Glenwood corner kick in stoppage time, leading directly to Vargas’ clincher at the other end of the field. Glenwood had a number of chances in the first half to jump on the Huskies, but the Demons couldn’t crack the code that was senior Jackson Borg in net for Battle Mountain. Junior German Alvarado had a chance to open the scoring early in the first half, receiving a pass from junior Alan Videla, but Borg stood tall in net, making the save to keep it level at 0-0. Battle Mountain answered with a chance at the other end as senior Hidalgo Ortega put a header on net off of a long throw in, but Ortega’s try skipped just wide of the left post. The Demons mounted another chance midway through the first half as the physicality racheted up. Sophomore Justin Garces had a chance at a header off of a corner kicker from Mireles. 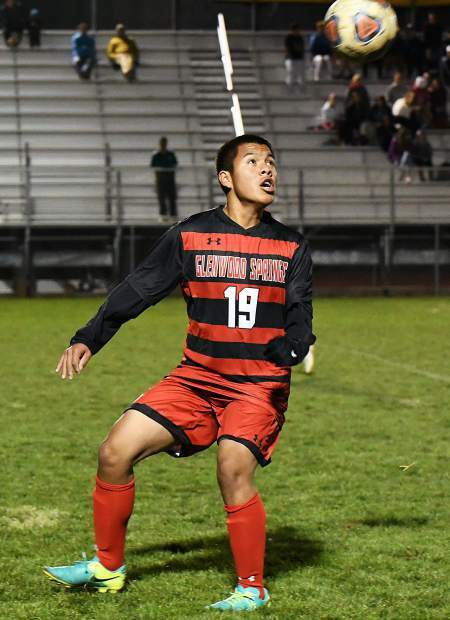 The sophomore leaped higher than Borg and made contact with the ball, but he wasn’t able to angle the header down towards the net, resulting in the shot sailing over the crossbar on Glenwood’s best chance of the night to that point. Taking advantage of Glenwood’s missed opportunity, Barajas struck with 20:12 left in the first half, corralling a misplay by the Demons near midfield before racing in on junior Carlos Guardado in goal for the Demons, firing a left-footed strike to the far right post, giving the Huskies the ever-important 1-0 lead on the night. Trailing at the half, the Demons came out and started to put together some chances offensively, drawing a number of free kicks from opportune areas on the field. Mireles had a free kick in the first half that gave Borg fits, but the Huskies’ keeper was able to punch the ball out of harm’s way, resulting in a corner kick for the Demons. Normally efficient on corners throughout the 2018 season, Glenwood couldn’t find that one key touch off of corners to get on the board in the pivotal league matchup. With just over 10 minutes left in the game, the Demons drew another free kick from midfield, where Mireles lined up for a crack at the goal from 45 yards away. 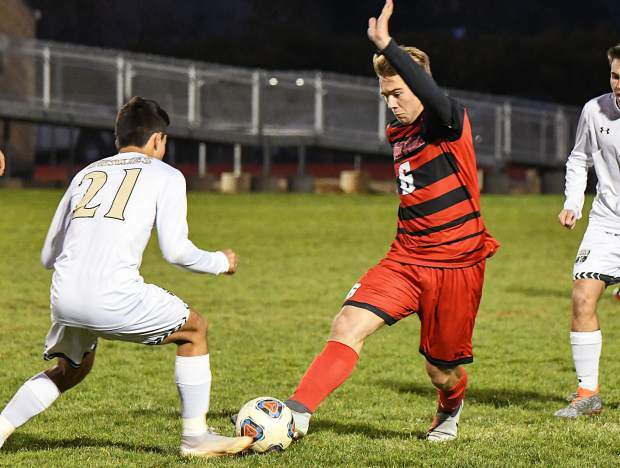 The senior, who has scored a number of goals throughout his Glenwood career on free kicks from that distance, fired a strike on net the handcuffed Borg. The senior reacted late to the arcing shot and punched it skyward into what appeared to be the top of the net just inside the crossbar for what should have been a Glenwood goal. Instead, the ball ricocheted downward quickly, allowing Borg to slap it out of the way. 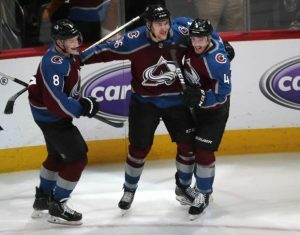 The officials allowed play to continue, taking away what appeared to be the game-tying goal. 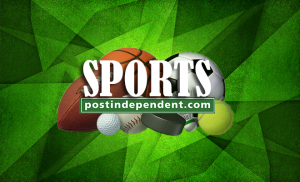 Unfortunately for Glenwood, the World Cup’s VAR system is unavailable for high school soccer on the Western Slope. Putting the could-have-been goal behind them, the Demons continued to push for the equalizer, leading to a great run up the middle by Alvarado. As he reached the attacking box, Alvarado had contact made from behind from a Battle Mountain defender, resulting in his shot attempt bouncing wide of the mark. On the first call, the officials gave Glenwood a corner kick in stoppage time, but after further discussion took the corner away from the Demons. 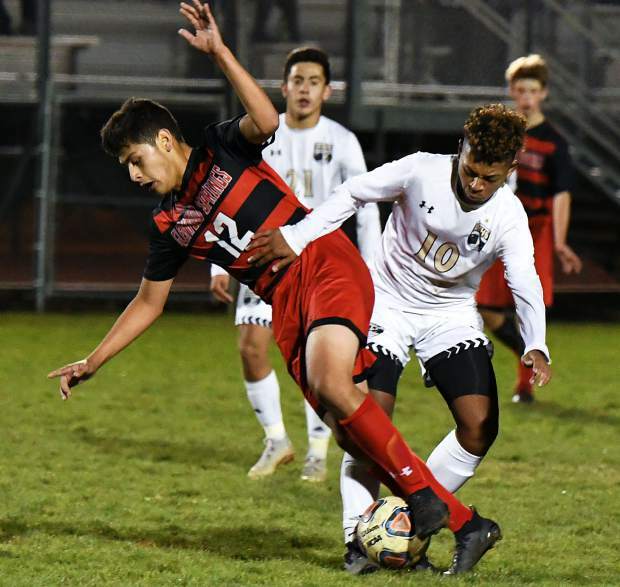 No penalty, and no corner kick on the play ended up being the final nail in the coffin for the Demons as Vargas went the other way off of the goal kick and fired a rising shot past Guardado for the final tally of the game. The loss ends Glenwood’s shot at a league championship and marks the end of the regular season. Should Steamboat Springs lose to Battle Mountain Thursday in the season finale, Glenwood would finish second in the league standings, marking the best finish and season record under Smith in his five years in charge of the program. Now, the Demons await Sunday morning’s 4A Colorado High School Activities Association’s playoff seedings.